Forgot about Beslan, but remembered about Myanmar! On September 3, the RIA Novosti news agency reported: “There held a protest against the actions of the government troops of Myanmar against the Rohingya Muslims at the Myanmar embassy in Moscow. In Bolshaya Nikitskaya Street several hundred-people gathered at the Embassy of Myanmar in support of the Rohingya Muslims who died during the clashes”, – said an agency source. Law enforcement officers and guardsmen are on duty at the site of the rally, fences are built along the sidewalks. Their cars are from the beginning of the Nikitsky Boulevard almost to the end of Bolshaya Nikitskaya Street”. Indeed, very strange but it’s a fact. Despite the great hatred and enmity of the Kremlin to Islam and Muslims, an unsanctioned rally of Muslims was held in Moscow on September 3 in support of their Myanmar co-religionists whom they simply physically destroy under the tacit consent of today’s godless world community. Everyone was surprised by the behavior of policemen, which is not typical for such a situation. Despite the fact that the rally was not sanctioned, no one called upon the gathered Muslims to disperse. The police only fenced off the sidewalks of the street on both sides of the roadway and did not allow the crowd to go out on the road, as there were no clashes between the police and the protesters. Although we observed in the past, any such kind of unauthorized rallies were dispersed with truncheons, everyone was arrested and taken to the nearest police stations. Moreover, at the rally there were different appeals from the crowd, which Russian authorities could simply describe as a call for extremism and terrorism. Takbir “Allahu Akbar!” came from the crowd. In an interview with journalists, some Muslims are emotionally saying: “If they do not solve the problem, I swear by Allah, we will do jihad”; “The lawlessness is going on in the Earth! We are here to show that we are dissatisfied – the children are killed, the women are killed, the old people are killed – the genocide!”; “We’ve come here to support the Muslim brothers, and not only we, but all the nations of the world should have gathered here, we want to deliver this to Putin! The papers solve nothing! I hope he sees this meeting”. There were also accusations of inaction and concealment of what was happening in Myanmar, accusations against the representative of religious and spiritual leaders of Muslims in Russia. 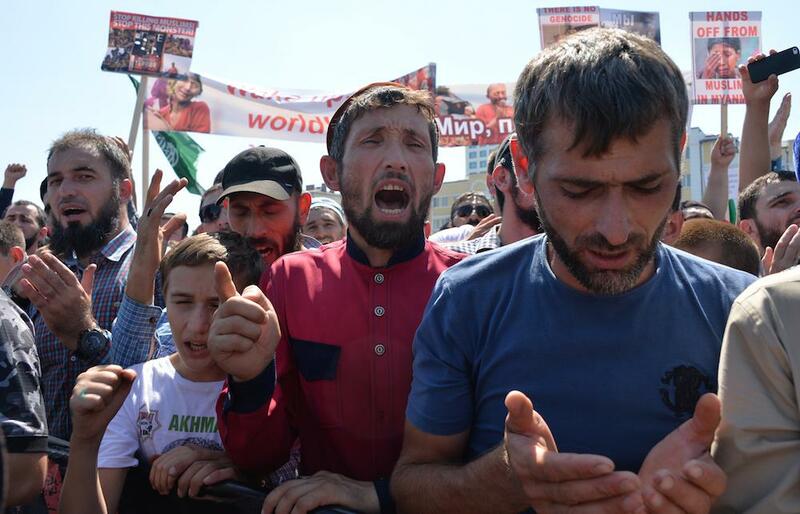 On the same day in Makhachkala, Dagestan, an unauthorized rally of solidarity with Muslims of Myanmar was held, at which about 1.5 thousand people gathered. The Muslims of the city walked through the streets shouting “Allahu Akbar”. On September 4, a rally of solidarity was held for Muslims of Myanmar in Grozny, Chechnya. The Ministry of Internal Affairs of Chechnya reported that 1.1 million people came to the rally. According to the Kremlin, these rallies became a complete surprise for them, but because the police calmly reacted to what was happening, that is, did not react at all, the media were silent, some questions and doubts arise. We are not talking about the speech in the Instagram of Chechen president R. Kadyrov who expressed his disagreement with the Kremlin’s policy over the Veto at the UN imposed on the issue of Myanmar Muslims. Kadyrov called the Buddhists “shaitans” and urged to “curse” them. “Even if Russia supports those shaitans who commit crimes, I am against Russia’s position, I have my own vision, my position”, – Kadyrov said. And after such loud statements from R. Kadyrov’s lips, unauthorized rallies both in Moscow and in other cities of Russia, the authority in the Kremlin, which is at war with Islam and Muslims, simply ignored what happened!? That can’t be real! Most likely there’s something different behind this! This action is skillfully aimed at distracting the Muslims of the country and simply residents of the capital from other events. These rallies could not coincide with the situation with several events. Firstly: on August 21, the mayor’s office received an application from the opposition to hold a demonstration and a rally on September 3, aimed at expressing the attitude of Muscovites to the policy in the field of town-planning, social, budgetary and financial activities. This was reported by Elena Romanova, a press-secretary of the Russian Security Department. “There was an application for a demonstration and a rally on September 3. The organizers: Davidis Sergey, Ponomarev Lev, Sokolov Sergey, Schneider Mikhail. The declared number of participants is up to 10 thousand people”, – said Romanova. This rally of the opposition failed, and they simply forgot about it. Secondly: on September 3 in Moscow near the victims’ monument of the tragedy in Beslan, there was to be a ceremony of laying wreaths and the action “Rally without words”. Let me remind you that on September 1, 2004, militants seized school No. 1 in Beslan, North Ossetia, and over 1200 pupils and teachers were held hostage there for three days. On September 3, the authorities decided to storm the school. In the assault 334 people died, 186 of them were children. There was no objective investigation of the tragic events in Beslan. The witnesses were forced to close their mouths. But still, the organization of the “Mothers of Beslan” despite persecution and threats from the authorities, constantly demand an investigation and demand to punish the perpetrators of the tragedy. In April 2017, the European Court of Human Rights ordered the Russian authorities to pay three million euros to relatives of those killed and injured in the terrorist attack in Beslan. The ECHR ruled that the Russian authorities failed to meet the responsibility to prevent a possible threat to human life and did not plan an assault so as to minimize the threat of hostage-taking. This rally that takes place in Moscow and other Russian cities every year and reminds the Russian authorities of their crime was also forgotten. And so, on the one hand, we see how the Kremlin authorities used the rallies in their own interests, and not in the interests of the Muslims of Myanmar. Allowing to hold unauthorized rallies, the Kremlin authorities allowed the Muslims of Russia to pour their feelings into these spontaneous actions, and thus forced everyone to forget about the many other important events taking place in the country. If the authorities in the Kremlin, or their protege R. Kadyrov, are worried about the fate of the Muslims of Myanmar, then why do they possessing strength and power sit and do nothing?! Send your armies to help the Muslims of Myanmar!!! So no, they will never do it!!! “You see the believers as regards their being merciful among themselves and showing love among themselves and being kind, resembling one body, so that, if any part of the body is not well then the whole body shares the sleeplessness (insomnia) and fever with it.”. This hadith was narrated by al-Bukhari 6011 and Muslim 2586. This once again confirms that the Islamic Ummah is alive, and it simply lacks the correct political view based on Islam. The Islamic Ummah lacks the political thinking, which will not allow Muslims to be deceived by all sorts of tricks on the part of the disbelieving colonizers and their servants in the person of our traitor rulers who usurped power over us. Only a correct Islamic political view will allow Ummah to regain its former great past, as it was under the rule of the right caliphs and after them, while we had the Khilafah (Caliphate). And this correct Islamic political view is given by Hizb ut Tahrir in its books and its work on the revival of the second righteous state of the Khilafah (Caliphate) by the method of Prophethood. And only the revival of the second righteous state of the Khilafah (Caliphate) by the method of Prophethood will save the Muslims of Myanmar and of other lands from murder and persecution. And may Allah help us! Next PostRohingya: Abandoned by the World!